Welcome back to another busy and exciting term in the OC. School begins for students tomorrow, with Week 1 already shaping up to be very busy. 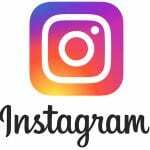 Our school photos will take place on Wednesday, so please ensure students are in full school uniform and that photo orders and money is brought in to school on the day. Our Stage 3 Interrelate program also begins this Wednesday, so please return any outstanding permission notes ASAP. Our school ANZAC service will be held this Friday at 12noon, led by our student leaders. Parents and caregivers are most welcome to attend. A reminder that entries for this year’s UNSW Spelling and Writing competitions need to be returned to school by Monday Week 2. Entries for English and Maths close on Monday of Week 9. Be sure to visit the OC Events page as I will be updating it regularly with activities and events for the term. Looking forward to a super term! 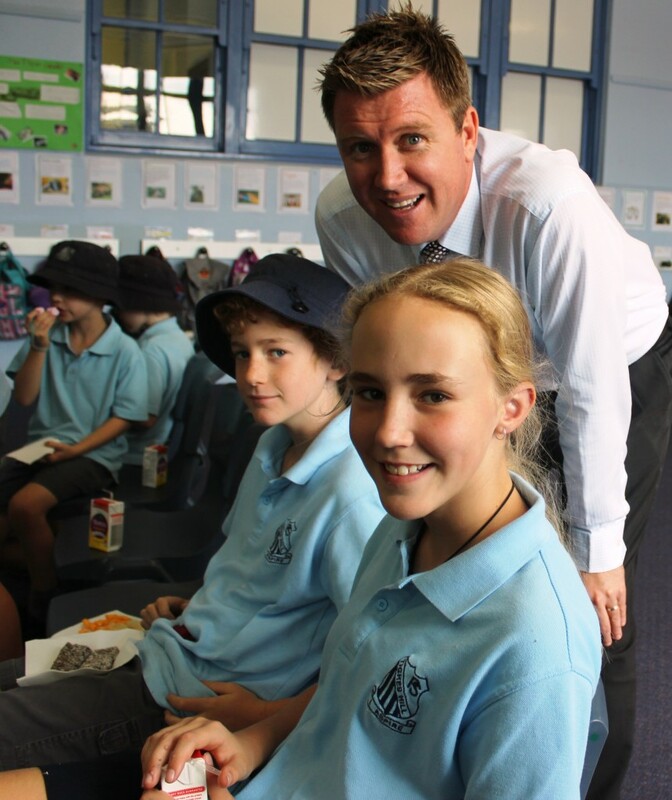 Congratulations to Sarah and Oliver who were our Principal’s Personal Best recipients for Term 1. 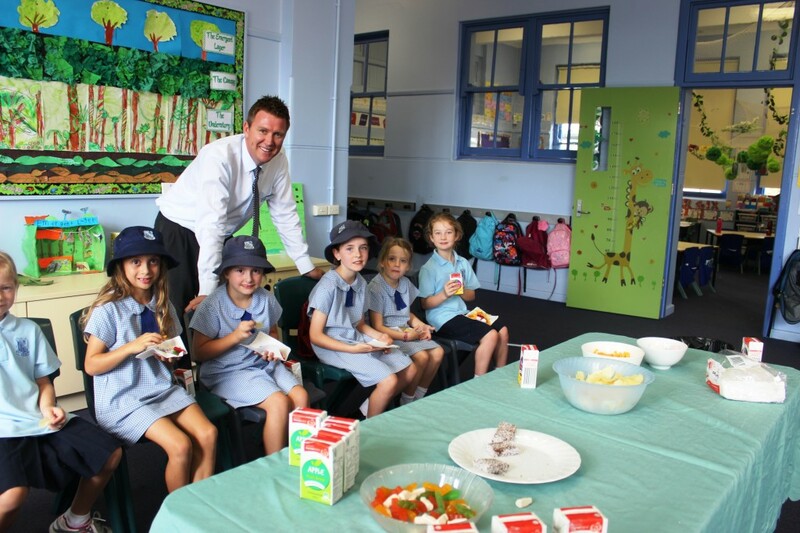 On the last day of term, they were invited to a special morning tea with Mr Selwood and the 2 recipients from each class. Well done to everyone who got involved in today’s Easter Hat Parade. It was great to see so many students from the OC make a huge effort with their hats and win so many raffle prizes! Have a super holiday. Yesterday we had our Stage 3 excursion to Taronga Zoo as part of our Global Environments unit. We were able to explore the zoo in small groups thanks to our wonderful parent helpers – Mr Tregilgas, Mrs Eastwood, Mrs Cooper, Mr Rodger, Mr Wasson and Ms Harris. Some of the highlights were the amazing flight show, the new Lemur adventure trail and watching the elephants get a hose down. Well done to everyone for their terrific behaviour. Enjoy the photos below! Congratulations to all of our students who achieved 80% of their stars this term and participated in an amazing star card reward day today. Mrs Bowman did a super job organising this term’s event. There was a range of great activities including apple-bobbing, skipping, a disco, ice blocks, gladiators, teacher target practice, three-legged race and many more! Well done to the OC who were super helpers setting up and assisting the younger students. A terrific day was had by all! It’s been an exciting few weeks, as our new books for our class library have been arriving daily! 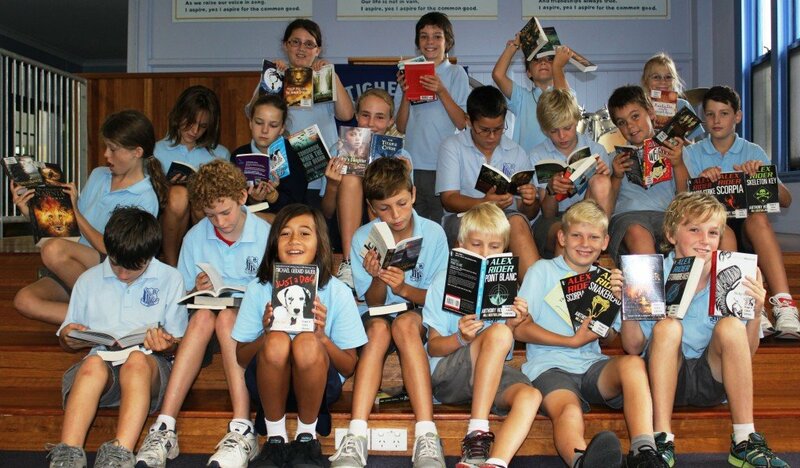 Thanks to last year’s super fundraising efforts, we have been able to purchase a great amount of new novels for students to access for independent reading at home and school. As you can see from the photo we have quite a selection to chose from! A huge thank you to Mel (Nelson’s mum) for helping me with the very time consuming task of covering all these books. We’re almost done and you’ll soon start to see students bringing home some great titles (new and classics) to support reading in the coming days. Today we had our last visit from Dr Elena Preito-Rodriguez from the University of Newcastle. Dr Elena has visited our class numerous times during the term to teach us all about maths in technology. Students have enjoyed participating in a variety of tasks that have involved learning about binary numbers and deciphering codes. Today the students put their knowledge and skills to the test and had a go at some computer programming using tablets with an app called Lightbot (free from the app store). This involved programming commands for a cute little robot around a geometric grid. A big big thank you to Elena for giving up her valuable time to work with us this term. We have really appreciated her effort, expertise and entertaining lessons. We look forward to catching up with her for some more mathematical magic later in the year. Congratulations to all the students who participated in our Karate sport program this term. Sadly, Friday was our last session but it has been absolutely amazing to see the skills and techniques that students have developed over 10 weeks. Our Karate instructor, Sensei Marc, was so impressed by our students that he decided to award scholarships worth $170 to the students who had shown the most progress and skill throughout the term. Well done to Joseph, Declan and Liam who received a certificate for training sessions at Newcastle Karate, a uniform and yellow belt. It was very difficult for Sensei Marc to choose only a few students as there were so many who have done an amazing job this term – and are now yellow belt grade. If you are interested in participating in Karate outside of school, a link to the Newcastle Karate website is attached below. Well done, everyone! In the March edition of our School Magazine, Touchdown, students read an interesting article about famous authors who use pen names when publishing work and the many different reasons of why they do it. Accompanying this article was a competition that the OC entered, which involved writing an 80 word introduction to a story. Students had 3 choices – If Only, Lost or The Magnificent Mistake. Students also had to create their own pseudonym to go with their work. Below are links to examples of our fantastic entries. This week students combined art with HSIE to participate in the Wet Tropics rainforest poster competition. This involved creating a poster to persuade visitors to sustainably explore the rainforest and reef whilst being mindful of the area’s unique plants and animals. Winners will receive prizes from the competition sponsors Skyrail and Big Cat Green Island Cruises and also have their work featured in next year’s calendar. Well done to the students who completed a poster for entry.